It’s starting to be the saddest time of year. This fall saw a slew of new TV shows, but nowadays there’s just too much television to keep track of. And as winter comes, fall TV shows get mown down like wheat. Sometimes, cancelation is a mercy. But here are 11 shows that died just as they found their feet. While we like to dismiss our pop culture artifacts as simply “good” or “bad”, many are in fact, fledgling properties in need of support, understanding and a guiding hand to lead them to greatness. This article intends to shed some light on a few series that, like an allergy or a cast-iron pan, got better as it went— regrettably, though, these are shows that didn’t live long enough to realize their true potential. Thanks to everybody who answered our question about shows that were canceled just as they were starting to find their groove, back in March! Long before the current CW series, CBS took a crack at the Flash in 1990—and they really threw everything they had into it. Starring John Wesley Shipp as Barry Allen and Amanda Pays as the S.T.A.R. labs scientist Dr. Tina McGee, the show featured original music by Danny Elfman and composer Shirley Walker, who supplied incredible motifs for each member of the Flash’s Rogues—as she would later do so famously on Batman: The Animated Series. While the initial episodes aimed for a more grounded, “street level crime” approach, it was quickly decided the show needed villains, and it needed them fast. After some against-the-grain casting choices, Captain Cold (Michael Champion), Mirror Master (David Cassidy!) and The Trickster (Mark Hamill!) made their appearances—and Hamill’s wonderful Frank Gorshin-inspired performance somehow even managed to pack more energy than the erstwhile Riddler’s. The show was popular enough to inspire several creative decisions on the current Flash series, including elements of Walker’s score, its cast—with Pays and Hamill even reprising their characters—and perhaps even the casting of David’s daughter Katie Cassidy as Black Canary on Arrow. But The Flash ultimately proved too costly to produce on its grueling $1.6 million-an-episode budget, not to mention its competition in the ratings: Originally airing Thursdays at 8PM, the show went up against The Cosby Show and The Simpsons—a later schedule change to the awkward 8:30PM timeslot only lost and confused more viewers. In the series finale, “Trial of the Trickster,” the Trickster manages to put Central City on trial (for crimes against himself, mainly)—with the aide of a brainwashed Flash and his proto-Harley Quinn sidekick, Prank, portrayed by Corinne Bohrer—Veronica Mars’ alcoholic mom, Lianne! The lesson here: When you have something interesting—in this case, great villains—don’t save anything for later. Here’s a case of a show whose later episodes open up tons of fascinating storytelling potential, but they never actually aired at all. While the first few episodes of Bryan Fuller and Todd Holland’s Wonderfalls are indeed some shade or hue of amazing, the series was pulled from Fox’s schedule after only four episodes—which means that we missed out on the best stuff. Concerning the adventures of a Brown philosophy graduate living in a trailer park who-may-or-may-not be receiving messages from animal toys scattered around Niagra Falls, Caroline Dhavernas as Jaye Taylor was, so it seemed, a slam-dunk time bomb calibrated to the year 2004. Sadly, it wasn’t until years later and a begrudgingly released DVD set from 20th Century Fox containing all thirteen episodes that the show began to find the following it deserved. Had the series continued, Jaye would have been institutionalized for “Joan of Arc Syndrome” as her therapist profiteered from a book collecting their sessions together, while her sister, Sharon (Katie Finnerman), would start a religious movement around her immaculate pregnancy. Her brother, a theologian named Aaron (Lee Pace), would document her transition to spiritual leader. All the while, a newly minted wax lion would forbid Jaye from following the orders of her old, disfigured one. Still, the four aired episodes did garner a small, grassroots campaign to save the series headquartered at the website savewonderfalls.com—its users mostly comprised of deserters from the doomed campaign to un-cancel Angel. Steven Spielberg’s prehistoric time travel drama Terra Nova was hyped as television’s “next big thing” when its $14 million premiere debuted on Fox in 2011. The saga of the Shannon family, who escape from a polluted future earth to reboot civilization in the Cretaceous period, was over-billed as the show that would appeal to everyone from “grandmas to gamers”. Terra Nova was Continuum meets The 100 meets Swiss Family Robinson—with dinosaurs. But showrunner Brannon Braga had a tough time finding a focus for all the drama and mixed stand-alone family episodes with CSI–style mysteries and a super slow-building mythology, while parceling out the dinosaurs in too small doses. Gamer bloodlust was disappointed, and grandma was just confused. The thirteenth-and final-episode featured a promising mix of gore, heartbreak and intrigue as pioneers heading to Terra Nova were simultaneously attacked by dinosaurs and blown up by insurgents. A rough day! Meanwhile, the Shannons discovered cargo from an 18th century ship; setting up new mysteries for a season two that never was. Fun fact, though: Shannon daughter Maddy was played by future Pink Ranger Naomi Scott! A horror/comedy about a father who sold the soul of his unborn son, Sam, to the devil, meaning that Sam will have to retrieve escaped souls from hell beginning the day he’s of legal drinking age, Reaper was a love-it-or-hate-it sort of series lasting one-and-a-half seasons on the CW from 2007-9. As we learn, souls are captured in “vessels”, which take the form of everyday objects tailored to the sins of their intended hell-ghost – apparently working on a similar principle to the traps in Ghostbusters. While season one mainly focused on “soul of the week” stories (including the inspired choice of Patton Oswalt as William McKinley’s assassin, Leon Czolgosz) the show didn’t truly come to life until its second season, which saw the inclusion of Jenny Wade as the demon, Nina, and Armie Hammer’s truly sleazy, all-too-real depiction of the Son of Satan—a trust fund kid named “Morgan”. In contrast to the Satan-flavored stoner comedy the series began with, season two would more confidently play with themes of Catholicism and its mythology, dealing with the fallout of a demon insurrection and what exactly the devil means as a force of nature—and just maybe if he’s a part of god himself. The series ended on a down note with the soul of Sam’s love interest, Andy, now under the ownership of the Devil, too, after Satan bested Sam in a game of Quarters—but she was a good sport about it. The disequilibrium of its expense-to-ratings ratio lead to the series being axed after a truncated thirteen episode second season— and on a cliffhanger, no less! But those who stuck with it are still on tenterhooks to see how it would resolve today. Essentially an earlier incarnation of Reaper, Brimstone told the story of a detective named—coincidentally, “Stone”—indentured to a Devil impishly portrayed by John Glover. Like Sam, Stone is forced to recollect the spirits from the underworld who have managed to slip through Satan’s fingers. Here’s the kicker, though: Instead of capturing them in boxes, the only way to send a soul back to hell is to physically gouge the person’s eyes out! If you hadn’t guessed, Brimstone was not even slightly a comedy. Lasting only one season, the series ended on its best episode, “The Mourning After” which used a killer “snakes on Valentine’s Day” MacGuffin to drop its repetitious “…of the week” formula and instead explore the ethics of Stone’s predicament. The series ends on a touching-in-the moment, but funny in the abstract, scene of Stone getting one last glimpse of his ex-wife as he hides on the rear loader of a speeding garbage truck to capture series’ monstrous arch-villain, Ashe, played, surprisingly, by Teri Polo. Angelic-looking Christina (Elisabeth Harnois) washes ashore in Point Pleasant, New Jersey and is taken in by the kindly Kramer family, as one does. But Christina is not as wholesome as she appears, and soon the Kramers and their friends are beset by misunderstandings, forbidden desires and mysterious accidents. Christina is actually the daughter of the Devil and meant to incite Armageddon, when she’s not stealing people’s boyfriends or generating lust in good-hearted priests. Starring Lake Bell as oceaonographer Laura Daughtery, the series focused on the discovery of monstrous oceanic creatures suddenly appearing worldwide. Though the premise alone should have been enough to keep the series aloft, it was sadly axed after a mere fifteen episodes. It was perhaps a bit slow—many episodes involved a teenager hiding one of the young monsters as a pet, like E.T.— but the show ended on the image of an oncoming flood carrying dozens of monsters, while a gigantic tidal wave threatened to obliterate a church housing the entire cast! Surface this is another case of a series sacrificing its present “watchability” for a theoretical, distant future—of sea monsters. Based on the DC comics series teaming Huntress, Barbara Gordon and Black Canary, what should have been the most fun show on television was, sadly, content to belabor the same metahuman-of-the-week story and the exact same scene where the Huntress (Ashley Scott) does aerobatics around Detective Jesse Reese (Shemar Moore) while he asks, “When you gonna tell me your name? !” Meanwhile, scenes with Mia Sara as Dr. Harleen Quinzel seemed to hint at a larger story arc, or something that would approximate one. Eventually. Facing cancelation, the producers wisely said, “to hell with it” and did stories featuring Clayface, Clayface’s punk son, and a magnificent Battle Royale between Harley Quinn—in full costume—and the Birds of Prey set to t.A.T.u.’s All The Things She Said. This was how Birds of Prey should have started, not how it should have ended. But for a brief moment, it was great. Based on the 1991 film and the direct-to-video franchise it spawned, the Sci Fi Channel’s attempt to bring Burt Gummer and the Graboids to the small screen was met with universal indifference—but what potential! After a cloud of a chemical agent called “Mixmaster” creates mutant shrimp, bacteria and cacti, Gummer and the citizens of Perfection, Arizona must put things to rights. With a little more love and polish (namely, a second season order), Tremors: The Series could have appealed to the intersection of fans of speculative biology and explosive, makeshift weaponry. If nothing else, the series that was gave us a handful of truly excellent creature designs. Pitched as the darker, sexier entry into the beloved Stargate franchise, the series had nothing in common with its light-hearted counterparts. And as Stargate Atlantis had been canceled in favor of this new show, fans who were primed to dislike SGU found plenty to loathe. 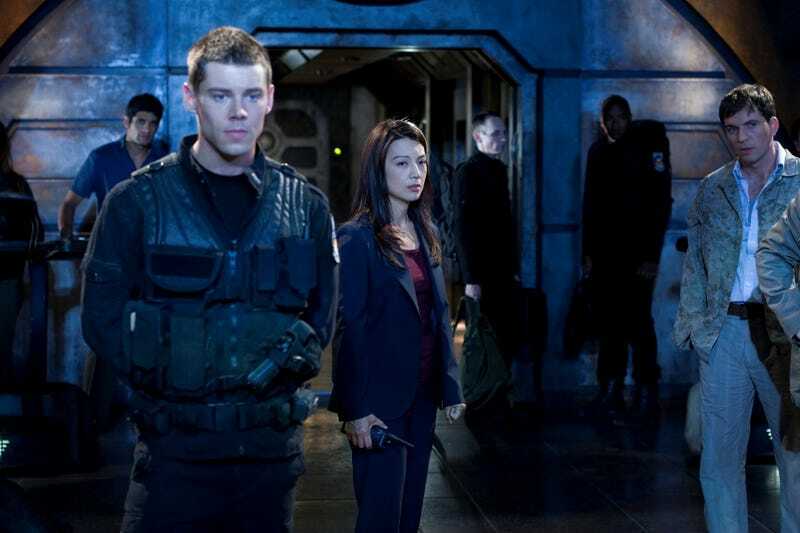 The show began with a terrorist attack disabling a Stargate dial in, forcing a diverse group of soldiers, scientists and politicians to flee through a wormhole and land on an Ancient spaceship, the Destiny, that they cannot control. Though the premise provided plenty of opportunity for action and adventure, priority was given to character development—in the guise of romantic moping and questionable alliances. The show relied rather a lot on a clever trope in which crew members could utilize Ancient technology to visit Earth utilizing Ancient technology, which transferred consciousness and was used by Lou Diamond Phillips character to cuckold a fellow crewmember long distance. SGU was Battlestar minus the clever plotlines, and Stargate without the fun, and the writers began to take notice. By mid-season, tiresome mysteries were resolved and the crew began to work together, and maybe even enjoy the adventure. But much of the audience had already given up, and multiple schedule changes confused those who remained. Who knows? If the show had been called Destiny instead, it might have had a better fate.